This is a reprint book from the 1970’s with two classic Silver Age stories featured, one involving Captain America and one Iron Man. Captain America battles the Red Skull, I don’t remember much of the details. 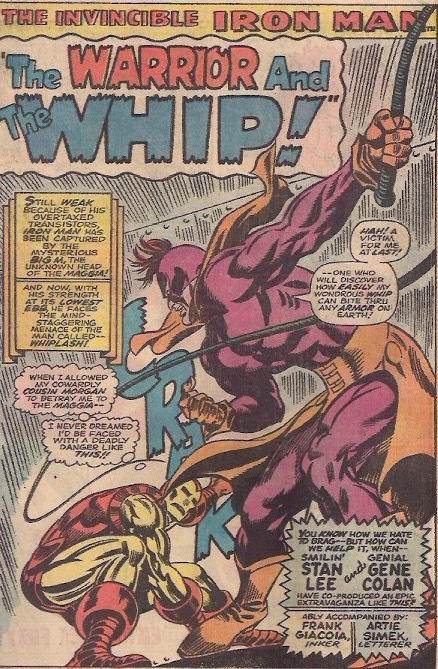 However, I do remember Iron Man being beaten mercilessly by Whiplash, making him seem like a credible threat in my eyes. What the internet sounded like a few weeks ago. The first story begins with Captain America pledged to do the Red Skull’s bidding for 24 hours in order to save New York. The general public is unaware of Cap’s reasoning and think he’s a traitor. We’re already into the 23rd hour and Cap and Skull orbit the earth in the Red Skull’s Sky Craft. The Red Skull has waited these 23 hours to ask Captain America the location of the XPT-1, the newest nuclear submarine. Cap stalls for a bit but Skull tells him that he knows the Avengers would have received briefings on the location and Captain America relents with the coordinates. For the final command of the Skull’s control he orders Captain America to sit in an electronic chair, inexplicably without asking him to relinquish his shield. (the first thing I would do!) The chair determines that Cap was not lying and sends the Avenger flying backwards stopping under a laser. Luckily, Cap uses his shield to deflect it and escapes, headed to save the submarine. All that trouble and don't take away the shield?! Skull then takes control of the minds of the submarine's crew, ordering them to surface. "Hmm, where to bomb first?" As the Red Skull is deciding which city to nuke with his new toy. Captain America gets on the communications system and warns the Nazi that the submarine was experimental and going to be destroyed after it’s final voyage. Skull decides that instead of leaving he’s going to attempt to fire at least one missile, but the vessel blows up before he can launch. The Precursor to the Fathead. Iron Man, is low on transistor power and in the clutches of Whiplash, after he was betrayed by his cousin. He’s being beaten pillar-to-post. His armor is being ripped apart by the whips of Whiplash! The reader feels the brutality of the fight. In a last-ditch effort the Armored Avenger manages to pull out an image producer which creates multiple hologram Iron Men, and then he starts revolving them capturing Whiplash in a game of Thee Card Monte, unsure which Iron Man is the Iron Man to hit. Meanwhile, Jasper Sitwell, SHIELD Agent, is looking for Tony Stark and is informed by the guards that Iron Man left with a man claiming to be Tony Stark’s cousin. Nick Fury is informed and SHIELD joins the search. He also meets Tony's girlfriends. Tony Stark lives the gimmick! Back to the action and Whiplash is mowing down the hologram Iron Men one-by-one until there is only the real deal left and is ordered by his boss to finish his foe off. Remember kids it's not the mafia, it's the Maggia. If your arm ever looks like the guy on the left's see a doctor. Not really, the book is two fun Silver Age stories that you would expect from Marvel in the 1960’s, however the Captain America story doesn’t hold up. It’s silly on all accounts. In order to save a city he pledges his loyalty to the Skull, but is ok with him taking control of a nuclear submarine? Also, Red Skull acts just like a Bond villain of the time. He comes up with this elaborate plan to kill Captain America, but doesn’t even stick around to get the satisfaction of watching him, his mortal enemy die. He also doesn’t take away the shield, his one weapon! Even on the Batman TV show from the 1960’s they’d take his utility belt. Just dumb. Also, how was the ship set to blow up with the crew on it? There was no party ready to pick them up and they only left because they were ordered off by the Red Skull, who I assume was planning on running an entire nuclear submarine by himself. It didn’t add up. However, the Iron Man story was a lot of fun. The setup was simple, his cousin sold him out to the Maggia (Mafia) and now he’s being beaten to death by a guy with a whip. Will our hero escape? Gene Colan’s art is light years ahead of Gil Kane’s in the first story, which looked a little cartoony for my tastes. Colin’s was much more detailed and better to look at. You would be better served picking up the trades that collect these books if you’re looking for classic Avengers stories, or if you’re the collector type, the original Tales of Suspense issues. As you can see this is my original copy. We start gearing up for the new Ghostbusters film and check out a vintage issue of The Real Ghostbusters from Now! Comics. It's The Real Ghostbusters #2 next week!